As Christmas 2014 draws to a close, I have spent the better part of my day reflecting upon the happenings of the past year. I have been thinking about the struggles that my family and I have endured, the wonderful blessings that we have received, and the abundance of wonderful people who have touched our lives. It suddenly occurred to me, while pondering the generosity of friends, family members and even acquaintances in my life, that I have not always taken the time to give thanks as I should. With the New Year quickly approaching, I decided to make a change. With a few very special people on my list that have yet to receive a token of my gratitude, there are some final touches that I need to make before I say goodbye to the 2014 holiday season. Since I don’t have a lot of extra cash to spend after the expense of Christmas, but I want to do something really special for my loved ones, finding just the right way to say “Thank you” has been a bit of a challenge. I’ve been searching for something that comes straight from my heart, can be delivered directly to my loved ones’ residences and places of employment, and is certain to be enjoyed by each individual on my list. After a few hours of browsing the web, I realized that I already knew just where to find the perfect gifts, and I don’t know why I didn’t think of it before. I remembered receiving an order of Gourmet Dipped Premium Strawberries from a friend last year right after Christmas, and let me tell you- they were truly amazing. Since ChristmasGifts.com had those same strawberries advertised on the site a few weeks ago, I got really excited when I realized just how simple this was going to be. 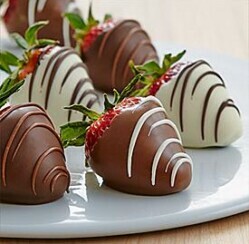 Shari’s Berries offers a wide assortment of gourmet chocolate treats, so I knew they would be an excellent choice for having hand dipped strawberries delivered to my loved ones. My favorite selection is the Full Dozen Gourmet Dipped Premium Strawberries that they offer for just $39.98. 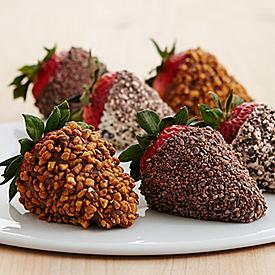 This gift includes 4 juicy strawberries hand dipped in rich milk chocolate and topped with salted caramel almonds, 4 strawberries dipped in decadent dark chocolate and topped with chocolate covered cocoa nibs, and 4 premium strawberries dipped in wondrous white chocolate and topped with cookies and cream crunch. The best part is that I can add chocolate dipped pretzels, chocolate dipped cookies or even double the strawberries for just a few dollars more, so I can customize the gift for each of my loved ones. After seeing these scrumptious berries again, and remembering the magnificent flavor of those I received before, I couldn’t help but order a few for my own family as well. Tell us about the special people who have made a real difference in your life this past year. How did you thank them?